SIGN-UP NOW AND RECEIVE YOUR FIRST 30 DAYS AT $2/PER DAY. Another premium member winner. Premium members initiated a position with a buy zone of $81-$83. The stock hit our target when it touched mid $88s. I released this current video a few days ago and indicated there was more upside from $88; and my thesis proved to be correct as the stock went as high as $90.18 (representing about +2 points) from this public video. I say this to say; you gain much more as a paying member but can still see some gains as a free subscriber. Stock continues to gain momentum and I do believe there is further upside. As a reminder; we want to hold on to our winners. Another premium member winner. We initiated a position around $64 . It was one of our more slow moving stocks; as we've had this position since March. Our target was finally hit when the stock hit the upper $69s. When I did this video a few short days ago; the stock closed at $71.01. In the video you're seeing now, I indicated there was potential upside. Since then, we've gone on to hit a high of $74.28. Representing +3 points for anyone who bothered to just subscribe to my youtube channel and took the time out to listen to the video. As a reminder; we want to let our winners run. $UAL Similar to $CAT, the stock sold off on some pretty bad press. When a stock presents itself with a good opportunity; you want to pounce on it. Premium members were alerted to this with a buy zone of $68-$69. Our initial target was hit and I did this video on May 7th, 2017, when the stock closed at $75.30. I indicated there was further upside and once again; anyone who bothered to subscribe to my newsletter and youtube channel; made out fine. The stock recently traded as high as $83.04, representing almost +8 points or $8 per share for anyone who took the time out of their day to just listen. Premium members are up about +15 points. $CAT Stock sold off a few weeks ago due to some really bad press. We saw this as a unique buying opportunity and looked to capitalize off of investors fears. I alerted to premium members a long opportunity presented itself with a buy zone of $90-$92. The stock hit a low of $90.34 and most recently, hit a high of $105.98. +15 points or +17% from buy zone. ​Similar theme; when I did this video; the stock had pulled back from the high of $105. 98 and was trading around $99. I Indicated there was more upside; anyone with a phone or computer who took the time out to listen; as of last week's high; was up +7 points or $7/ per share with CAT. Lock in profits along the way but this is why it's important to let your winners run. Again; find good entries and the rest will take care of itself. Another winner. Initiated a long position around $166. Stock currently saw a high of $193.74! Almost 30 points or $30/per share for every share held. My theme is: Hold on to your winners!! I do believe there is further upside with a continued bull market. $PENN Another premium member winner. Buy Zone $17.50-$18.40. Stock saw a high of $20.01 last week before pulling back. Stock is currently trading in the low $19s and I do believe theres further upside. The market is acting right and the stock from a technical perspective is bullish. Another premium member winner with an initiation price of $17.50-$18.50. Stock recently saw a high of $21.94 and has since pulled back to $21.09. I remain bullish and see further upside. Another stock that premium members were alerted to. Our entry zone was $64-$64.80. 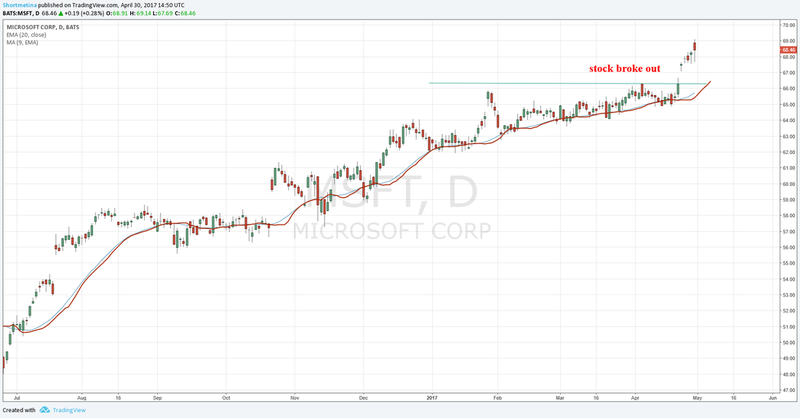 The stock hit a high of $71.86 last week and has since slightly pulled back. I do believe there is further upside. ​Still looks good from a technical perspective will do a video recap of this trade in the upcoming days.